Hiéroglyphes 7a+, slab. to the left of the GR, 30m underneath 10, Os Courts . Direct exit without the left arete. NB : the difficulty of the start has increased, due to the erosion of the soil. Sables Émouvants 7a, pillar, traverse, underclings. start completely to the left in the corridor, traverse via sandy holds and exit in the pillar to the right of 12, Le Château de Sable (red n°12). Prise de Position 7a+, slightly overhanging, arete. arete to the left of Sur-Prises , on the first boulder coming from the parking. Toiles de Maîtres 7a+, slightly overhanging, mantle. 50m to the left of Petit Tome (Petit d’Homme) , just above Le Rocher de la Salamandre (boulder with Mieux qu’un Rêve (and Menumental ). 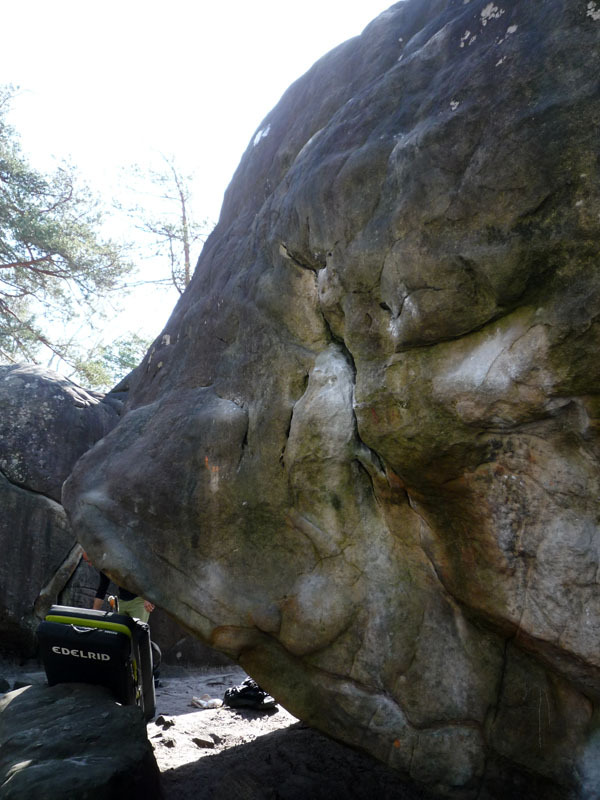 Start with jugs, take an oblique crack and exit by a mantle at the top of the boulder. Tête d’Œuf 7a+, wall, slopers, underclings. on an egg-shaped boulder 1,5km from the parking lot, to the right of La Route de l’Occident. Standing start, take underclings and exit on slopers. NB : lichened (March 2010). Rêve de Pierre 7a, wall, crack, slopers. to the right of 30, Le Tango Triste (salmon n°30). Start with the vertical crack and exit via slopers. La Pépite 6c, wall. to the left of 14, Tour de Clé , in the corridor. La Fugue à Loïc 6c+, wall, crimps. direct wall in between La Grande Allonge (white n°13) and 9, Le Fer à Repasser . 5, Les Câlins de Kim 7a, slightly overhanging, mantle. to the left of 38, L’Araignée . NB : the start from the right via a traverse is called 5bis, Cocaline (7b+). Le Bon Idée 6b+, slightly overhanging, sitstart. to the right of the boulder underneath 3, La Ventouse . Sitstart, dyno to an angle and exit via a mantle. L’Arête de Marbre 6c, arete. to the right of 10, La Dalle Cirée . La Fosse aux Lions 6b, overhang, sitstart. 10m above Le Chemin de la Vallée Close, along the path towards the main area, just after album 2163. Château de Sable 6a, wall. in the middle of the boulder of "la tête de chien", just left of La Route de Marie Thérèse. Spiderman 6a, crack, sitstart, slopers. on the boulder behind white 7 and 8 (children’s circuit), to the left of Plein Pot. Radium 6a+, arete. angle right hand just above the path, at the entrance of a corridor. Le Sein de Glace 6b, wall, arete, slopers. start left hand with the good hold of Alea Jacta Est and climb the right part of the wall, using the arete. Électron 6b, arete. 150m beyond Le Danseur , following the blue then the yellow path eastward; obvious boulder to the right of the path; the sitstart is 6c. La Blanchisserie 6a+, slab, arete. 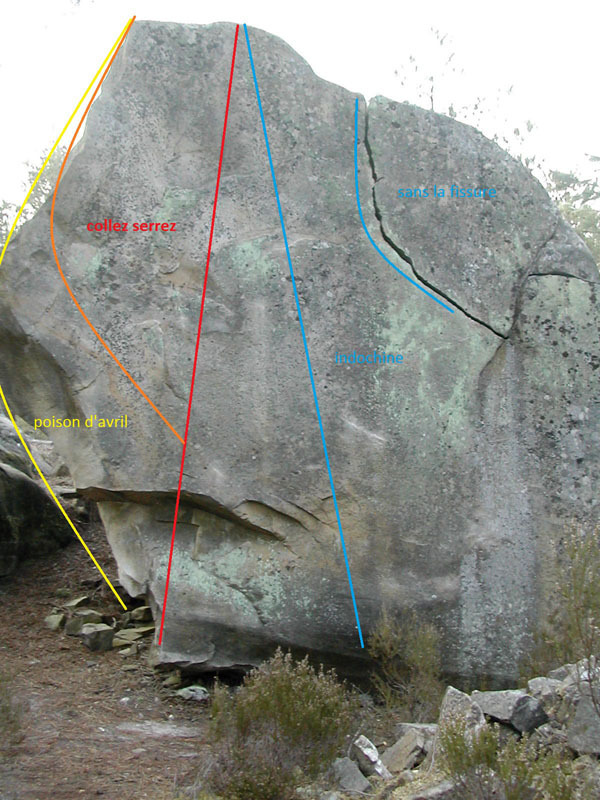 right problem on the slab to the right of Titanique (boulder marked "J"). 22, La Grattinée 6a, slab. Mauvais Présage 5+, wall. on the boulder of "la tête de chien", just left of La Route de Marie Thérèse; problem to the right of Château de Sable. Sucre en Poudre 5 , wall. to the left of Poussière de Roche , on the backside of the boulder of the boulder of "la tête de chien", just left of La Route de Marie Thérèse. 14, La Pleurnicheuse 6a, wall. mur souvent humide. 19, Pleine Lune 5 , traverse. 22, Dérive 6b, traverse. traversée aux prises un peu sableuses. 29, Petite Fugue 6a, slab. Le Virage à Gauche 4+, wall. 3, La Conque de droite 4+, wall. wall without the holds to the left, on the first boulder on the South of the area. La Sauterelle Vagabonde 4-, wall, high. high problem between 3, Fatigue and 20, Rancœur . 8, La Danseuse 4+, pillar, sitstart. on the backside of the boulder of 7, Le Porte à Faux . 12, Le Bibelot 4+, slab. to the opposite of Le Petit Toit , 20m to the South-East of Satan m’Habite . 13, L’Investiture 4 , wall, underclings. on a boulder 20m to the South-East of Satan m’Habite . 17, Le Trou Normand 4 , arete. low start on the wall with a big pocket to the left of 16, L’Œuf de Poule , on the second boulder to the West of the roof of Satan m’Habite .